Abba Sisoes says: Seek God, not where God lives. Then we become what the challenge of the moment summons us to be. Then Abba Sisoes’ word of spiritual advice—to seek God and not simply the trappings of the spiritual life—becomes real, becomes true. Life is not an exercise in spiritual gymnastics. It is one long, unending attempt to put on the mind of God wherever we are, whatever happens to us on the way. We are not here to pray our way out of life’s challenges. We are here to grow through every one of them into spiritual adulthood. The shrines and special prayers and holy pilgrimages along the way are spiritual oases meant to build our strength for the rest of the way. They are not God; they are simply signs that the God who made us is with us. It is that relationship that counts far beyond any particular devotion. 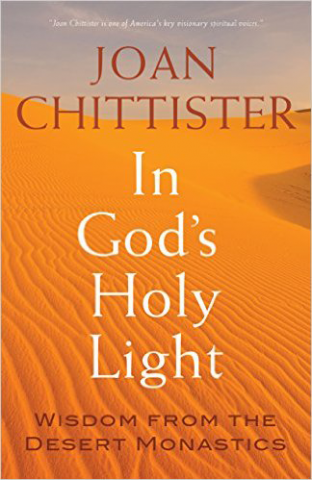 In God's Holy Light: Wisdom From the Desert Monastics by Joan ChittisterAbba Sisoes held the secret of the really spiritual life. However faithfully we have cultivated a favorite devotion, he warns us, we are not to allow ourselves to be beguiled by any of them. Each and all of them have only one purpose. They are meant simply to point in the direction of the consciousness of God at all times and in all places.